*Updated to include descriptions that fit on the BACK of the circle! Now they are *PERFECT* for anyone who comes in your class to lead a Brain Break! If you've already downloaded, just go to "My Purchases" to redownload! Thanks!! 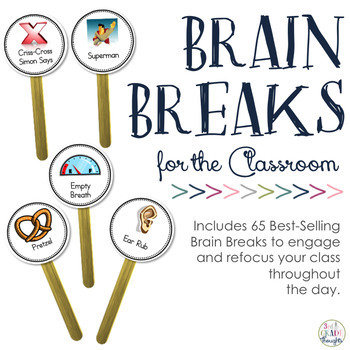 This is a collection of 65 different Brain Breaks for the classroom. These can be used as transitions, breaks in the middle of an activity, something to raise or lower the energy of the group, team-building activities, and more! Each brain break is accompanied by a description of how to do the exercise that can be glued onto the BACK of each activity, making it easy for you to remember all of these and for a sub, parent, principal, or student to know what to do each time a Brain Break is pulled! This packet also contains 6 blank circles to create your own text-only Brain Breaks and descriptions with the editable PDF template. These illustrations are 2" across with full-color cartoons to illustrate the activity. Use these on popsicle sticks and choose, or place them on a poster for display- the possibilities are endless! Read more on my blog 3rd Grade Thoughts. ** If you have previously purchased this set, go to the "My Purchases" tab at the top of the page to re-download the updated set for FREE!